Sadly life has been ridiculously busy lately and as such I haven’t had much time at all to work on my miniature village or any of my other miniature projects. Maybe I’ll have something new by this weekend. I can admit it when I’m wrong. My method for creating the “perfect” one inch block was wrong. I got so caught up in the excitement of creating a square I missed the reality that my square was about 3/32″ short of a perfect 1″ square. So, back to the drawing board? Not quite. I think I’ll still be able to use my method for creating a 29/32″ square for my sidewalks and pathways, I’ll just need to create a small gap inbetween the sidewalk tiles that I’ll fill with some product. I think in the end it will give the sidewalk more character. On the plus side I did find some perfect one inch square tiles that I’ll be able to use as templates in the future. At Michael’s (the craft store) I found a package of 1″ square mirror tiles. These will work brilliantly as templates for future tiles. The only downside is that I’ll have to carefully avoid breaking any of them. Also my order for Merlin’s Magic arrived in the mail last night. I haven’t had the opportunity to cast anything using it just yet, but when I do I’ll post a brief review. In other news I did attempt a late night casting of Tiny Bricks Mold 5. It turned out alright, but not spectacular. This had less to do with the quality of the mold than it did with the softness of the product of was working with, and my own ineptitude. Tiny Bricks Mold 5, Arrived! I got home from work yesterday and my wife informed me that I had a package. 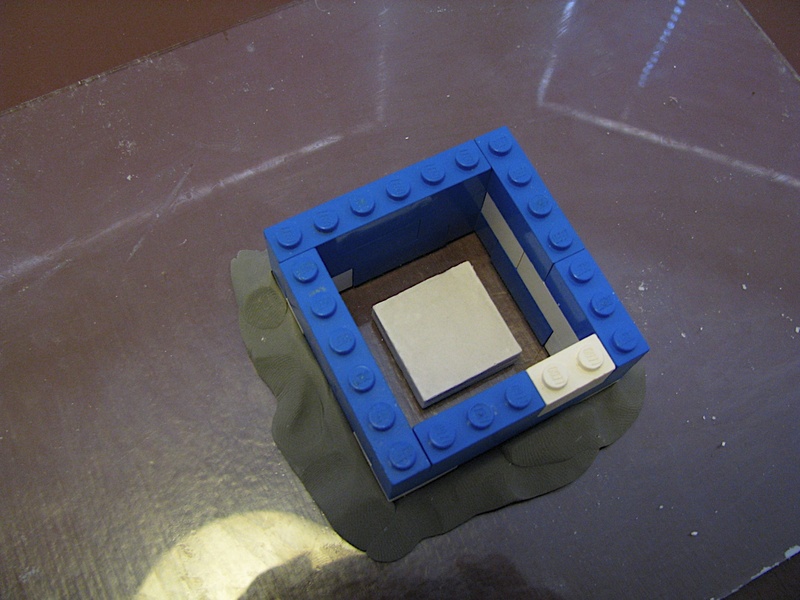 I immediately ripped it open to discover A & K Studios Tiny Brick Mold 5. I was excited, then I was reminded by my significant other that we had to be at someone elses house for dinner. I slowly put down the mold and stepped away. Therefore, while I do now have the mold in my possession I have not yet been able to attempt to cast anything. I would like to highly commend John Keebler and A & K Studios for their fast response times and their incredibly fast shipping and handling. Here’s a pic to tide anyone out there over until I can do a more thorough review. In order to get my project started I created four basic types of walls for every exterior facing type: A wall with one door and one window, a wall with one door, a wall with one window, and a blank wall. Here are some pictures of my first attempts at creating master walls, molds of the masters, and some early casting attempts in the molds that I have made thus far. This might not seem like such a big deal, but for some reason I had issues creating a 1″ square tile. I figure if I could find a way to make the “perfect” tile, I could then use it as a push mold for sculpey in order to create more detailed tiles down the road. I found a surprisingly simple solution. First, I searched high and low for a 1″ square cookie cutter, but to no avail. 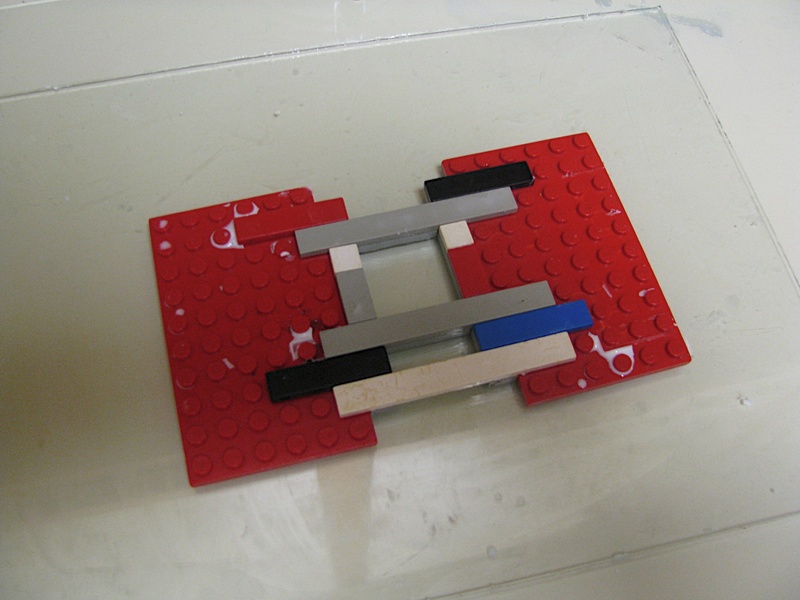 I eventually stumbled across some old legos and discovered that you could lay them out in such a pattern that they form a near perfect 1″ interior square. I then tried several different products to pour into the mold, and got the best results from using hydrostone mixed to the consistency of putty and pushed into the mold then scraped level with the top. Although these two pictures of the mold in use show me casting with resin. 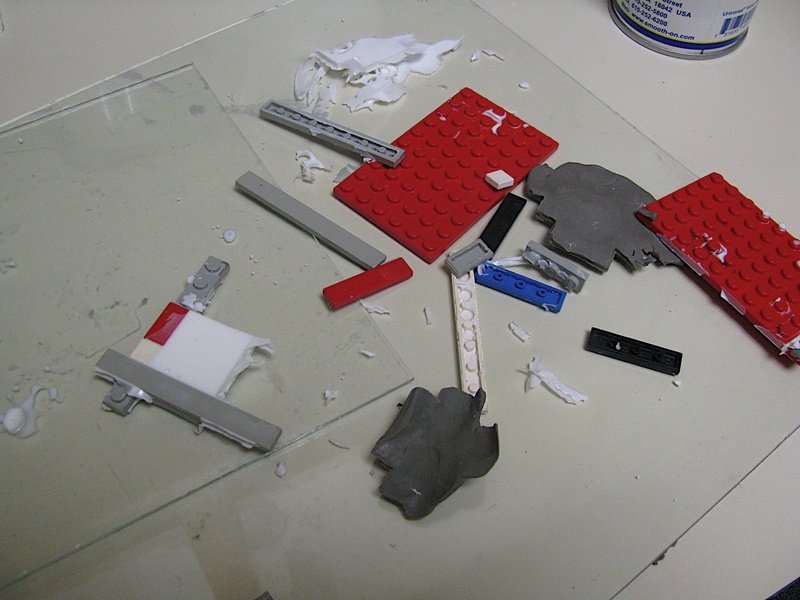 Once I created a good standard tile, I made a mold of it using mold max 30 from smooth-on. This was only the fourth mold I’ve ever created. Mold max 30 is a two part mold making RTV, and thus far I’ve had great success with it. It has been incredibly easy to use. 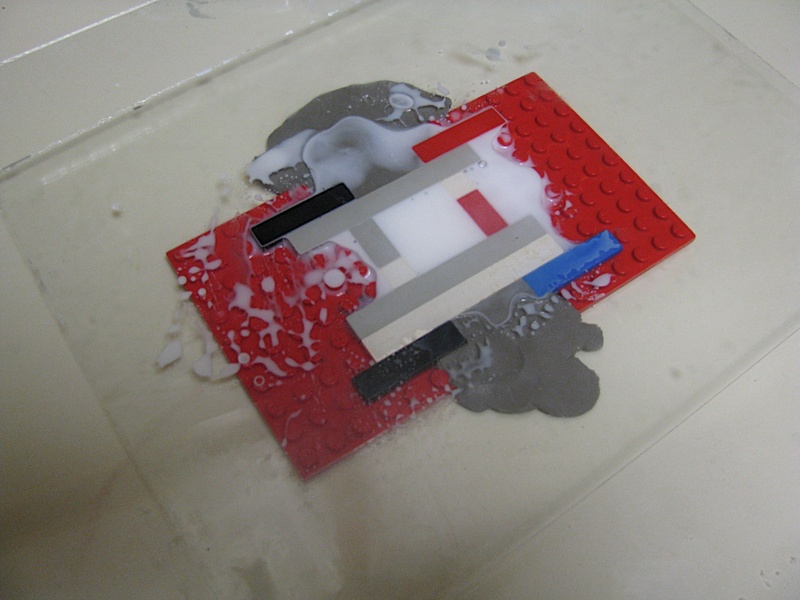 In order to create the mold, I took my favorite tile, glued it down to some glass (provided by an unused picture frame), and built a lego mold around it. For good measure I placed non-hardening clay around the edges to stop any seapage. I discovered the hard way while attempting to cast my first project that if you don’t glue smaller objects down they will float to the top of your mold making material. I know it seems pretty self explanatory, but we’re all allowed our mistakes… right? Here are some pics of the process. 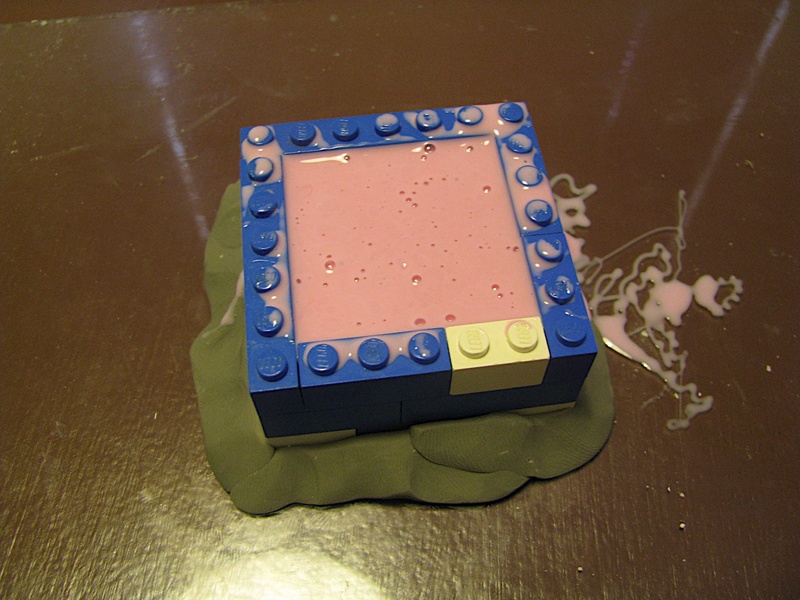 And that’s how I created a mold for my first batch of 1″ square tiles. Stay tuned for more information on how I plan on using the mold. Thanks for reading. 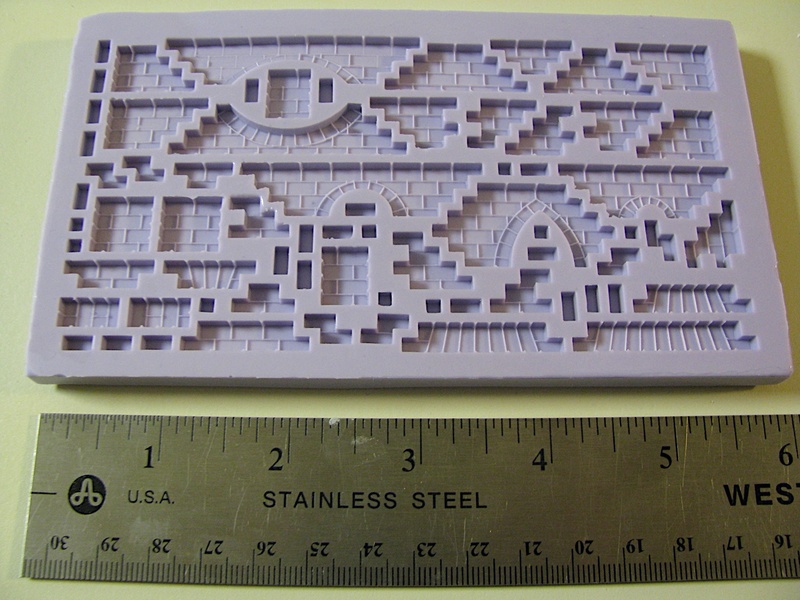 Got news from John Keebler that he has shipped my Tiny Bricks Mold 5. I also decided to try some Merlin’s Magic dental casting stone. Thus far I’ve been unimpressed with hydrostone, it hasn’t offered me as much strength as I’ve desired. I do like the texture, and it is easily mixed and poured, but some of the master molds that I’ve created have some thinner parts that need some more strength. I’ve been most impressed with casting in resin. But that has its own set of issues, not the least of which is the cost. Merlin’s Magic is a dental stone created with casting hobbies particularly in mind. You can check out usage instructions and a brief review on the Hirst Arts dental stone casting page. I ordered Merlin’s Magic from swordsofhonor.com. They had a quick response to my order and their shipping charges were the most competitive. 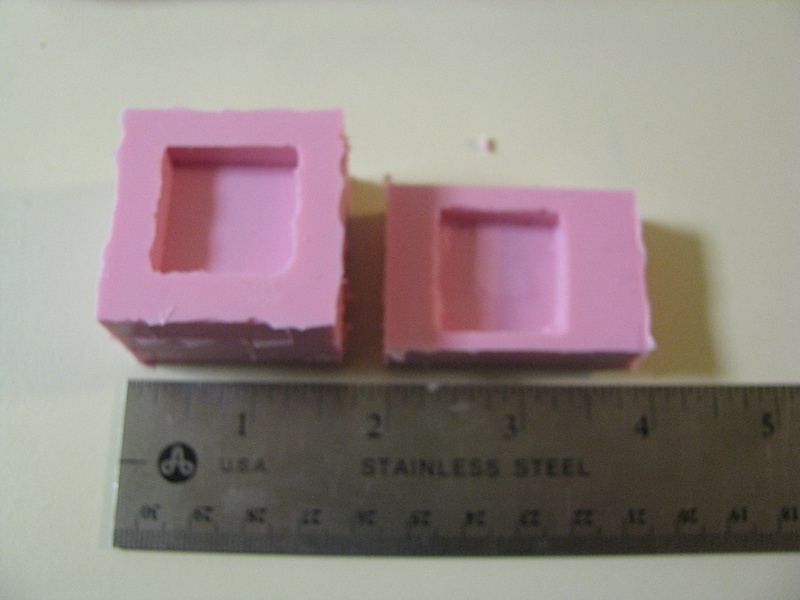 I will post a review of the different casting products I have attempted to use as well as a review of Keebler Studios’ Tiny Brick Mold 5, as soon as they are received in the mail. EDIT/UPDATE: After perusing the internet I’ve discovered that I’ve been improperly referring to A & K Studios, as “Keebler Studios.” A & K is a colaboration between Keebler and Abaroth. I apologize for not properly delineating.